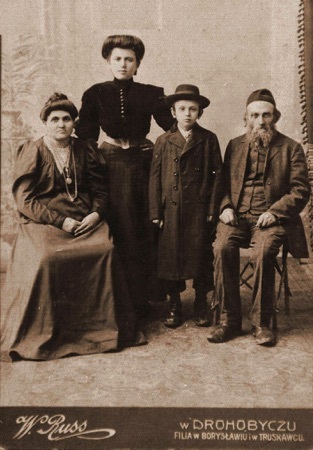 Gershon Gottfried (b. circa 1849) and his second wife, Feige Dawidman, whom he married around 1880, ran a store, probably a variety and grocery store, in Wolanka, a suburb of Borysław. Their son Elio Hersch (Elias) who was born 1897, took over the family business. This photo by the well known Drohobycz photographer, Wilhelm Russ ( see The Family of Wilhelm Russ) was possibly taken on the occasion of Elio’s bar mitzvah. 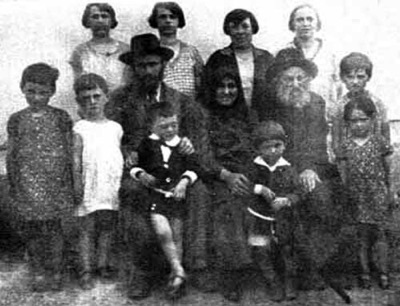 It shows Gershon and Feige and probably their son Elio Hersch and daughter Lea ("Leeny"). It was sent to Julius Krauss and his wife, Pauline (Pepi) Gottfried who lived in the United States. Pepi was the daughter of Gershon and his first wife, Esther Mirl Monat. Lea was born around 1891. She and her husband Leo (Leybish) Feldstein had seven daughters and one son. Their daughter Roza was possibly the only member of the family to survive the war. She married Henoch Kreisberg (Kammerman) and had one daughter. The second photo is a snapshot taken by Bette Hoffman (née Krauss) during a visit in 1933 to Wolanka. Bette was the American granddaughter of Gershon, who is seen here with his wife Feige and their son Elio Hersch with his son in his lap and his daughter in the white dress. The fate of this family has yet to be confirmed. Family legend has it that Gershon passed away of natural causes sometime after that visit and prior to the "Anschluss," the annexation of Austria to Germany. From the Borysław-Drohobycz Delinquent Water Bills 1941-1942 we can infer the fate of Elio Hersch (Eliasz). The following entries appears to refer to him. GOTFRIED, Eliasz 132 Konowalec 100 weggefahrt. These photos were submitted by Avrohom Krauss of Israel, the great grandson of Gershon Gottfried.